The union president and seven other union officers of the Korean-owned garments factory Sein Together Philippines were finally allowed to return to work starting November 2. They, together with around 500 workers, were laid off when the factory temporarily shutdown in late August. All the workers were forced or cajoled into resigning and accepting separation pay, except for 20 union officers and members who fought the shutdown as a union busting scheme by the company. When the factory reopened in late October, the 20 were not allowed to return to work even as some 200 of the retrenched workers, all non-union, were rehired by Sein Together. In a hearing at the labor court in the last week of October, the company stood pat on its refusal to reinstate the union officers. Twelve of the 20 union officers finally accepted the separation offer, believing that that company will never allow them back to work. The labor court hearing was a result of the illegal shutdown complaint filed by the union. 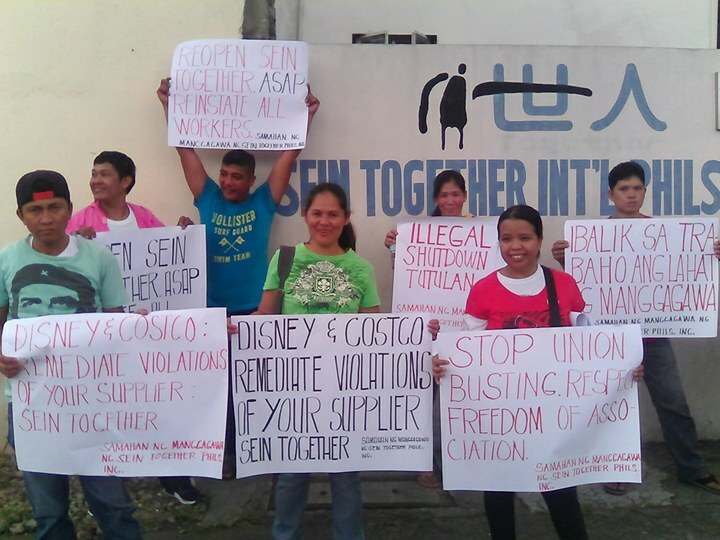 The reinstatement of the remaining eight union officers was the outcome of a series of protests by the union and their suporters, and actions by brands, specifically Disney, on the alleged freedom of association violations at Sein Together. The union expresses its gratitude to their allies in the workers movement, to the International Labor Rights Forum and Disney. In a mediation meeting facilitated by the Labor Department on November 3, the company formally declared that the eight union officers are reinstated to their former positions. The union asked that all retrenched workers, whether union or non-union members, be rehired. The company refused on the grounds that they have sole discretion to hire workers. 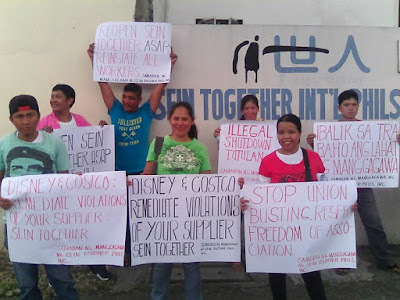 The union’s complaint at the labor court for illegal shutdown remains pending and the workers are demanding backwages for the one-month period of the temporary closure of the factory from late August to late October. The company averred that the closure was due to lack of orders but the union asserts the shutdown was merely a ruse to force workers to resign and bust the union. The shutdown was the culmination of a series of moves by the company to subvert freedom of association since the workers started organizing a union. The union reports that Disney-branded products are not being manufactured at Sein Together at the present time.